Feeling like that old song says, “I always feel like, somebody’s watching meeeeeee … ” ? Well, heh, heh, it is because us critters, we are eeeeverywherrrre! And to prove my point, there are certainly plenty of critters in the news today. So I thought I’d share a few interesting anipal stories with my chicos. Oh and if you are getting any ideas about complaining, watch out Pops! I have a feeling that should you ever try the “It’s the Chihuahua or me” ultimatum with my Mama, I know which side of this poll she’d fall under 🙂 The survey numbers as reported by NPR say 84% said they would stick with their significant other vs 14% who chose the pet. But they didn’t ask me and my Mama. There was also some ridiculous news today warning pet owners that sleeping with their significant four-leggeds posed some health risks — even the Bubonic plague. Really? Are you kidding me?!?!?! Compared to all that people are exposed to EVERYDAY when they leave us to go to work and school? I believe a fellow blogger, Snoring Dog Studio, has taken up the issue and confronted it well. ‘Nough said! Thankfully there are plenty of humans that understand us critters and true love. How about the story of Dr. Noel Fitzpatrick, an amazing vet from Surrey, England who is devoting much of his life’s work to helping pets with the latest technology. These new bionic critters have gotten a second chance at life thanks to an amazing big human heart. Similarly, Ann Weaver, an animal behaviorist living here in my neck of Tampa Bay, has been watching over coastline construction and how it has impacted “255 of her closest research subjects,” bottle nosed dolphins. Cool story on Tampabay.com. Lesson learned? Maybe if we take the time we can all learn to coexist. I’m glad someone is looking after my buds the dolphins. I love it when we go for walks by the waterfront and they look up at me and wink. That’s my report for tonight. Signing off from the living room couch, I say good night, chicos! 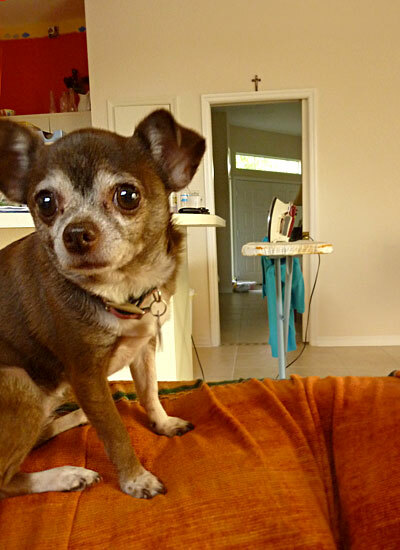 Hometown hounds make this chihuahua proud! Wooo Hooo! I just gotta give my fellow Tampa Bay pooches a paws up on this one. It seems that on the recent Suncoast Animal League “Dogtoberest” celebration, there were soooo many pups in costume that they broke a Guinness World record – 426 doggies in duds! Check out their story and pictures on Tampabay.com. Way to go, chicos! Wish I could have joined you but my humans were out of town. Know that I was there in spirit and cheering you on from the couch. Next up on the events agenda, Happy Howlidays. Catch ya there!! You are currently browsing entries tagged with Tampa Bay at Chihuahua Wisdom Blog.